I like making food with the things I have in the fridge, while it’s nice to have a bunch of recipes where you have to go out and but lots of interesting new ingredients. It’s always good to have a couple of recipes that will work with almost anything. That’s why I LOVE my vegetable frittatas. Really all you need is eggs, potatoes and an onion (which I tend to always kicking around at the back of my cupboard) it can be made with a whole host of different veg, and you can always add meats if you wish (I think bacon and sausage would be my favourites). For this I use a 10″ pan that is quite deep making it perfect for frittata but terrible for omelettes. This recipe is about enough for two adults for lunch. 1/2 an onion, halved and thinly sliced (red gives an interesting colour combination, but normal yellow onions are just fine too). Put the potatoes in a saucepan of boiling water. Bring back to the boil, then reduce the heat to a simmer. At this point you can add the chopped peppers and simmer for 3 minutes. Drain well, then cover and keep hot. Heat a 25cm (10in) nonstick frying pan over a high heat. Add the oil to the pan and swirl it around. When the oil is hot, reduce the heat to medium. Add the onion and sauté, stirring often, for about 3 minutes or until softened. Add the potatoes and peppers also at this point you can add the any of sweetcorn, tomatoes and mushrooms. 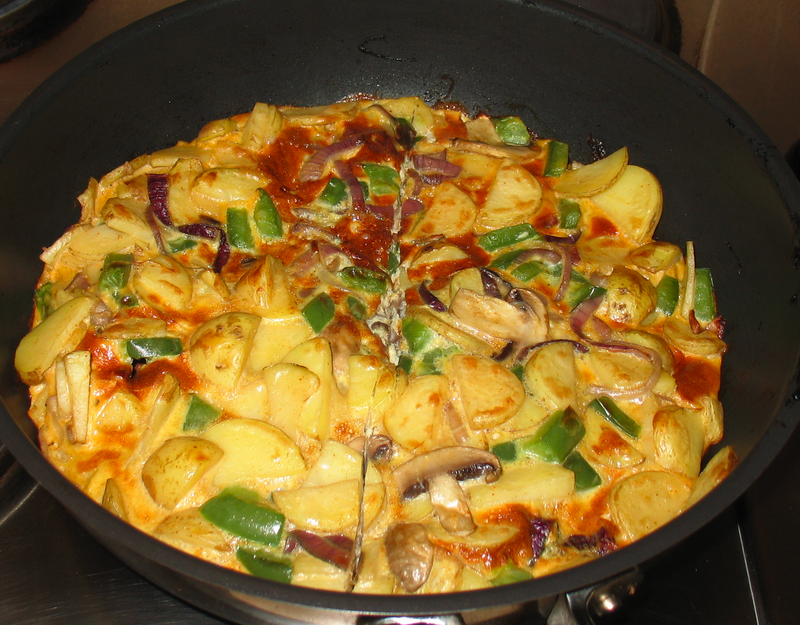 Continue sautéing, stirring and turning the vegetables, for about 8 minutes or until the potatoes are tender. Remove the pan from the heat. In a large bowl, beat the eggs and pepper to taste. Use a slotted spoon to add the vegetables to the eggs, stirring them in thoroughly. Replace the pan, with the oil remaining from cooking the vegetables, over a moderate heat. When the pan is hot, pour in the egg mixture, spreading out the vegetables evenly. Sprinkle the paprika on top, allow the frittata to slowly cook, shaking the pan frequently, for 3–4 minutes or until the edges are set and the top is beginning to look set. Meanwhile, preheat the grill to the hottest setting. Place the frittata under the grill and cook for 2 minutes or until the top is just set. Pierce the top of the frittata with a knife to check that it is cooked through. 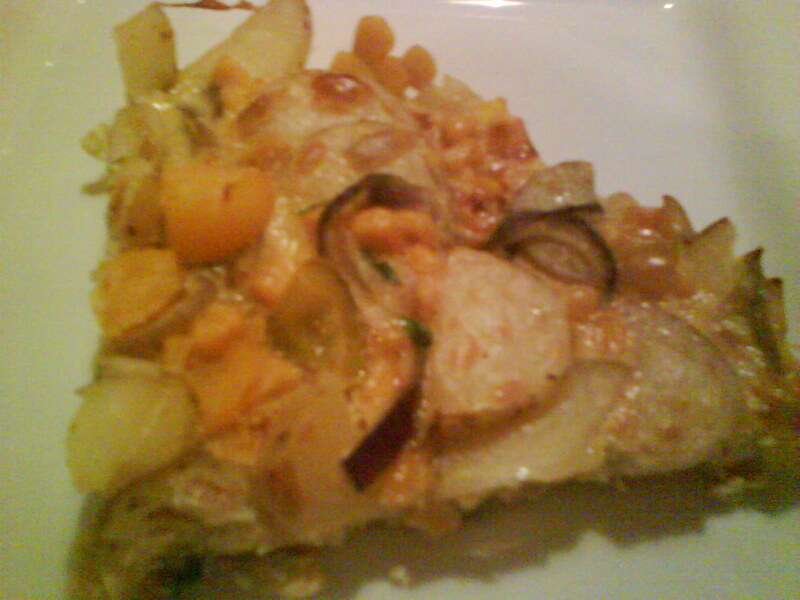 Remove the pan from under the grill and leave the frittata to set for 2 minutes, then slide it on to a serving plate. Serve hot or at room temperature, cut into wedges.